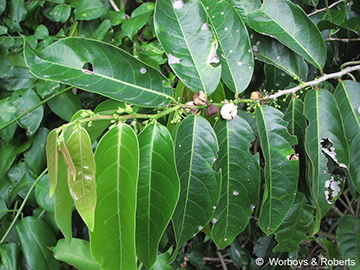 This shrub or small tree is glabrous. Leaves alternate, borne in one plane on the branches, broad to 17 x 7 cm, often shining on the upper surface. Inflorescence lacks a peduncle, axillary, flowers pedicellate, stout in female flowers. Capsule with 10 lobes, 12-14 mm diam., seeds with a scarlet aril.